Admittedly, various legal database suppliers seem to think that English/Welsh law and Scots law are interchangeable. For example: Westlaw. It’s developed a sort of “know how” product called Insight, which should allow more in depth analysis and updates on certain points of law. This is handy, and the sort of things our users like – no wading through articles or textbooks and checking if they’re up to date or take into account recent judgments – just nice primers on specific legal points. Which would be lovely, if Westlaw could remember that not all jurisdictions are the same. When I go into the Scots Law tab on Westlaw (which should restrict my searches to only Scottish material, hence avoiding a lot of time wasting and confusion when I’m looking for something with a specific Scottish meaning), it gives me the new option of Insight within that tab. “Oh good,” I thought, “they’re actually paying some attention to their Scottish users, and putting Scottish content on!”. So I went into the Contract section…and immediately was irritated. As you can see from the photo, despite Insight being within the Scots law tab, the information on contract is for English law, as “The Law of Contract in Scotland” by William McBryde is the core text for Scots law. Wrong. Oh so VERY wrong. 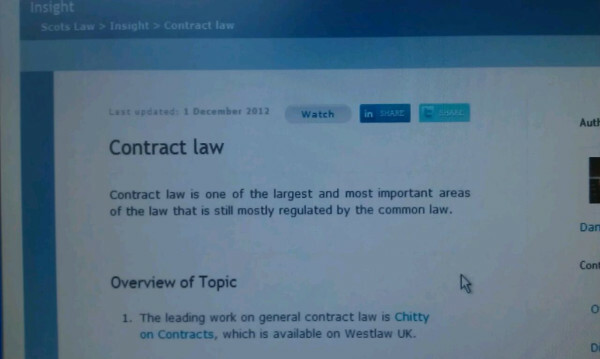 Even more glaringly wrong when you consider that McBryde is available as an electronic book on Westlaw, just as they inform us that Chitty is. If a resource is inaccurate and/or misleading, it teaches the service users to mistrust it: how much time will I be wasting telling my users that Westlaw’s accurate…but only up to a point…usually…and really, it’s best to double check everything they do on it? How about we just agree Insight’s inaccurate for any Scots law, and have it removed from access via that tab until it’s useful? And Westlaw’s not the only legal database provider being stupidly unhelpful and forgetting that English law and Scots law are not one and the same thing. 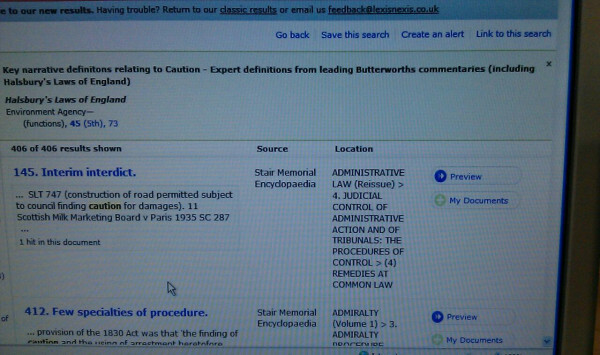 I used LexisLibrary to access Stair Memorial Encyclopaedia of the Laws of Scotland. Even ignoring the fact that their new style search results don’t work (a whole other issue we will need to go in to with them later), they’re working on being confusing too, although not to quite the extent as Westlaw. If I’m using Stair, I am looking specifically for Scottish legal information. I will not be helped by being given information from other jurisdictions. So helpfully inserting a suggestion at the top of my search about what a term means in an entirely different context is of absolutely no relevance to my search. It may be a “key narrative definition”, but it’s for an entirely different country, and for an entirely different topic! We, as the intermediaries for users of these resources, need to be able to confidently tell them: “Yes, that information’s accurate – experts in legal issues have checked the contributions and I can confirm they’re as good and reliable as you can get.” Right now, I just can’t do this, and it means our users trust in these (very expensive) resources is being eroded more each time they come up against a glaring inaccuracy. So, legal database publishers, lets try going over this again, shall we? Can you all repeat that until you know what it means, and stop trying to give us English/Welsh law instead of our own? Oh, by the way, you might want to remember that Welsh law is likely to start differing significantly from English law soon too, as their Assembly starts to exercise their powers. Try and take that into consideration for the future?